Whether you want to improve the customer service quality by evaluation agent and customer interaction? Or want to train new contact center agents? Or maybe driven by compliance issue or wanting some communication proof? All these situations always seem to require a call recorder. 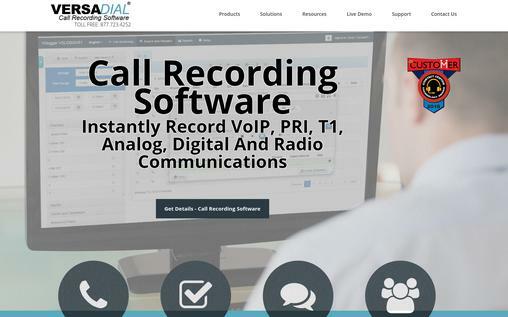 The call recording software makes call recording insanely easy by recording and storing the digital audio file so it can be played back and analyzed. We have listed some of the best call recording software which you may choose from as per your requirement. VRS Call Recording System is an effective multichannel audio call recording software that can be used to record phone conversations on multiple telephone lines simultaneously. It is perfect for quickly recording multiple audio channels. It can record phone calls on up to 64 lines simultaneously. It integrates with Axon VoIP PBx directly which can auto detect and automatically configure the VRS recording extensions. Call logging can be hardware activated, voice activated or manual. Reduce file size with high compression settings. The recordings are automatically compressed to MP3, WAV, or GSM files. You can log the recording details to CSV file or SQL database. It can also be used for general sound recording applications. Web access allows you to find and play recordings using any internet browser. The pricing plan starts at $99 for 1 channel. 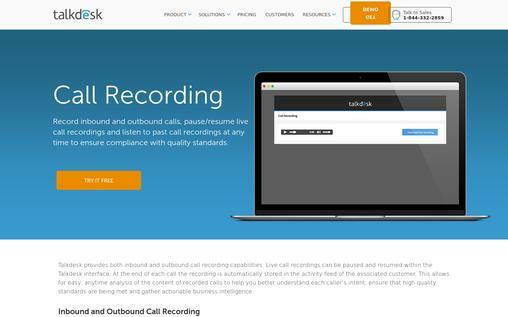 talkdesk provides call recording facility for both inbound and outbound calls. You can pause or resume call recording and listen to the past call and live call to ensure high-quality standards are being met. The encrypted software and tamper resistant recordings comply with all the regulatory guidelines. Record inbound calls, outbound calls, none or all calls with the option to change the recording setting any time at the click of a button. You get the flexibility to prioritize the calls that you would like to be recorded and stored. At the end of each call the recording is stored automatically in the activity feed of the associated customer. The interface allows you to pause and resume the live call recordings to ensure the most relevant information is recorded. You can listen to call recordings and review the content of recorded calls at any time. Manager can listen to call in real time and join a live call in progress to speak with the caller and agent. 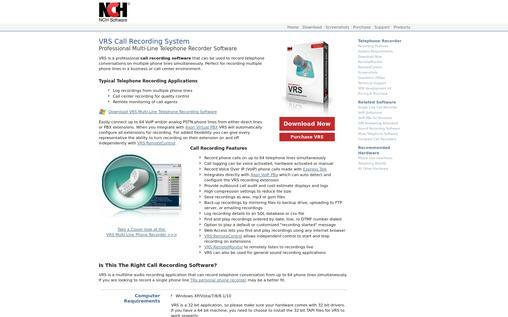 VSLogger is a call recording software designed and launched by Versadial solutions for businesses of all sizes. It combines call recording, QC Evaluations, Agent Time Utilization, QC Review and coaching, liability control and in-depth reporting. The user-friendly and responsive UI, allows the managers and call-center agents to simplify their daily interactions and be more productive. Audio and other calls can be recorded from VoIP, analog, proprietary digital PBX, radio, and other lines. Details of calls from multiple lines can be recorded at the same time. All the audio and video files are directly loaded and played in the software, without the need to download or open a new window. It provides you the facility of storing up to 150000 hours of audio recordings in an 800 GB Hard drive. The QC module makes it easy to grade calls and conduct general QC reviews. Run QC reports to monitor your employee’s progress. It facilitates capturing 100% of calls or specific channels and ensures regulatory compliance. Recordings are archived at a centralized location; accessible from anywhere by unlimited numbers of users. Get in-depth report on all your recorded call data. It will cost you from $150-$300 per channel depending on the complexity and your requirements. 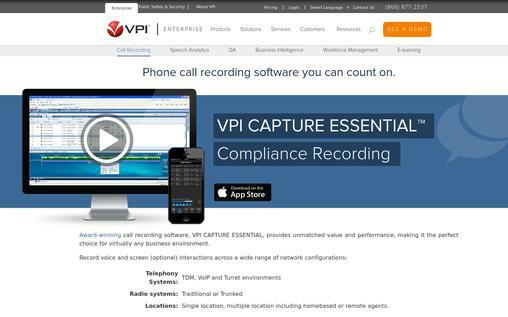 VPI capture essential call recording software offers one of the most advanced search, play and live monitoring options available today. It has a highly intuitive and user-friendly web-based access and administration. With each recorded call the time, date, channel, agent, inbound/outbound tags, length of call, and many other call criteria can be captured. The authorized user can tag a call with comments, flags, sales value, account numbers, etc. You can quickly and easily locate, visualize and playback multimedia interactions or single recordings. Save the recordings and email or export single or multiple call recording sets as secured standard files. It helps you to conveniently search, view and interact with date to recognize and accurately interpret call volumes, call handling times, inbound and outbound traffic peaks, workload distribution and many other patterns. It integrates with Avaya, Aspect, Cisco, Siemens, Shortel and more. 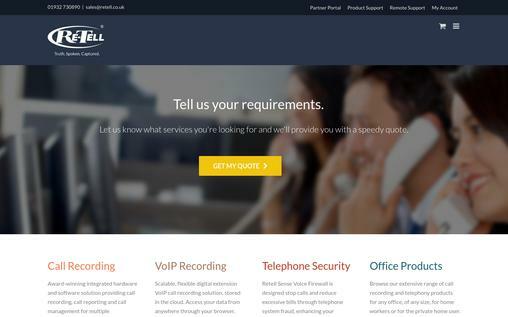 Re-Tell provides a professional call recording software to meet the requirements of SMBs, largest government departments, multi-seat call centers and financial trading floors. It covers a wide range of usages, from call center recording, call logging and music-on-hold to voice firewalls and PABX anti-phreaking and related PABX, toll fraud and hacking. It enables you to record, view, and playback calls. You can use call answering and call announcement before sending the call to telephone system. It provides a wide range of pre-built report to choose from; also you can create your own custom reports. Configure distribution list and send this information to specific user through email or FTP. It has a number of PC Compliance (optional) for their customers to prevent fraud and theft. The rule based recording allows you to exclude chosen telephone numbers, extensions, and users from being recorded. It gives 100% logical matching of PABX extensions to all the calls recorded on the trunk. 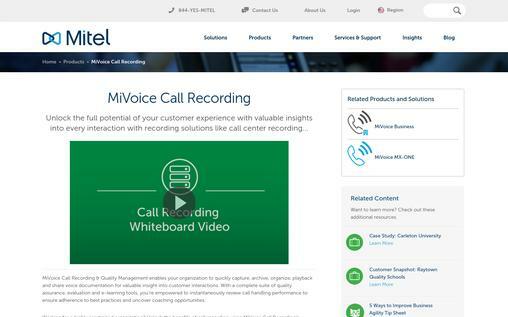 MiVoice call recording software enables you to seamlessly capture, organize, achieve, playback and share voice document for valuable insight into customer interactions. It is available in premise, private cloud and public cloud-based environment to meet your unique business requirements. You can monitor the interactions with your customers in real time and receive immediate notification (visual or/and audible) of situations requiring attention. You can securely access the call recordings through encrypted media file streaming. It provides a variety of workforce tools to managers, employees, and supervisors to analyze, monitor and enhance individual and group performance. Employee and customer evaluation to improve customer experience, service level and KPIs. It protects the most sensitive information of your customers to help you to gain their trust. 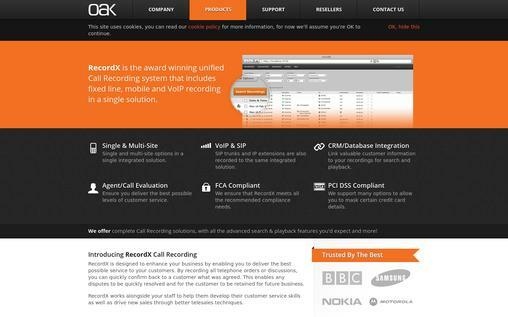 RecordX call recording is designed to enhance your business by helping you to deliver the best possible service to your customers. It enables you to record all telephone discussions and orders to quickly confirm back to a customer or client what was agreed. This helps to quickly resolve any dispute and retains your customers for long. It offers both single and multi-site option in a single integrated solution. IP extensions and SIP trunks are also recorded to the same integrated system. Allows you to link the valuable customer information to your recordings for easy search and playback. It performs call or agent evaluation to ensure you deliver the best possible level of support to your customers. It helps you to quickly find call recordings and email an extract to the client to confirm contract details. RecordX meets FCA and PCI DSS compliant. Noojee provides a complete call recording solution to enterprise call centers and other organizations. It records and stores the call to help your team refer back the actual conversation to get a clear understanding of your customer’s need and handle them better. It allows the managers to listen to the calls anytime to monitor agent’s performance. It provides you the option to choose the calls to be recorded. You can record every call, certain types of calls, specific agents, exclude or include specific parts of a call as per your requirement. You can find, playback or download the recorded calls from a simple and intuitive interface. It creates suppressed recordings or voice signatures whilst taking details of credit card to offer convenience to your customers while meeting compliance requirements. Choose between automatic recording, via an API trigger or by the agent. All the recordings are completely secure and only you can decrypt your recordings keeping the data of your customers secure. 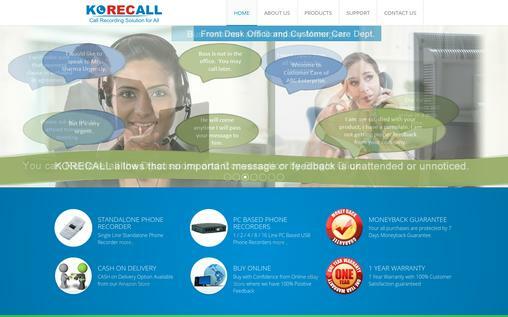 Korecall is a fully featured software that offers call recording solution to be installed on a customer’s existing PC. It hardly takes 5 minutes for installation and gives you full control over recording, live call listening, monitoring and storing. The recorded calls are stored in WAV files with crystal clear clarity. It automatically records all incoming and outgoing phone calls. It enables you to store up to 100000 minutes of recordings in 24GB hard drive. You can instantly search the phone conversations by number, date, name, etc. It records multiple phone connection on the same phone line. All the recordings are done automatically without requiring any manual operation, unless you want to listen the recording or live conversation. Allows you to mark the recorded files for future reference by adding notes. All the telephone conversation recorders have a 15 days money back guarantee. And all the hardware includes a one year warranty. Five9 is a cloud-based software that provides call center recording solution that monitors the interaction between your agents and customers. It maintains regulatory compliance and ensures that every caller is greeted and services in a nice and friendly manner. 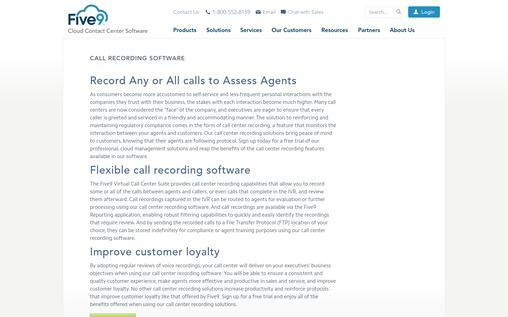 With Five9 call recording software you will be able to ensure quality customer experience, make agents more productive and effective in sales and service, and improve customer loyalty. It allows you to record some or all the calls between callers and agents, or even calls that complete the IVR, and assess them afterward. 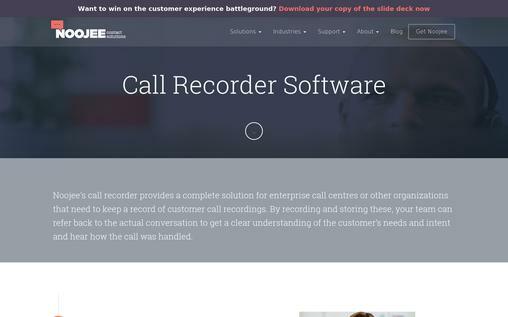 You can use this software to route the call recordings captured in the IVR. The Five9 reporting application enables robust filtering capabilities to easily and quickly identify the recordings that need review. It sends the recorded files to an FTP (File Transfer Protocol) location of your choice, they can be stored for agent training purposes or for compliance. With the help of the above list, once you have chosen the right call recording software, recording, storing and digitalizing audio/voice files will be a breeze and fun. And you can master this user-friendly software with a little practice.